This poor soul has come down with the deadly disease pomponitis, in which unsightly -- but pleasantly fluffy -- growths protrude from the head in unpleasant ways. Not particularly painful for the sufferer, unless they also happen to be a cat-owner, in which case secondary injuries may be sustained while sleeping. As the patient's illness progresses, the pompons eventually fall off and blow away like tumbleweeds, infecting any they touch. No cure is known, although cats tend to catch the tumbling pompons and extinguish them before they can infect others. 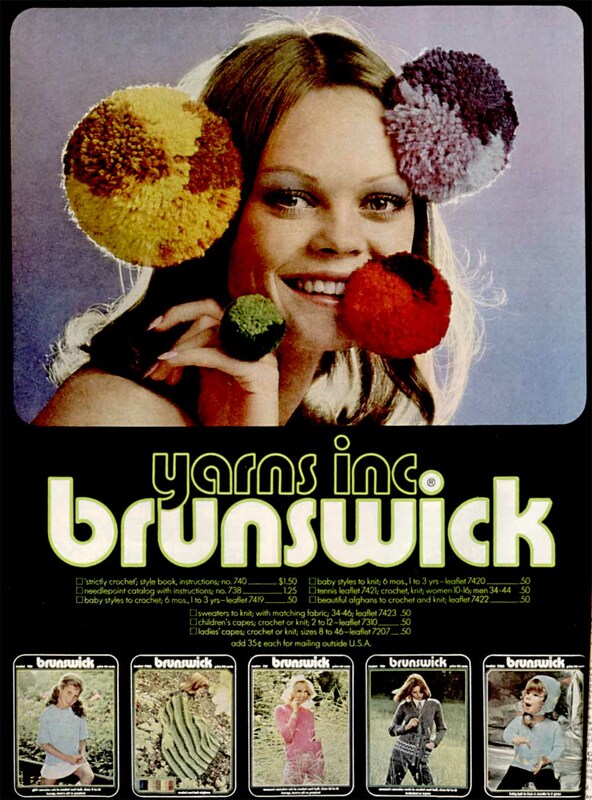 This, in fact, illustrates an advertisment for Brunswick yarns -- Brunswick Worsted Mills, Inc is still around (sadly, without a website), and their instructional booklets abound online. 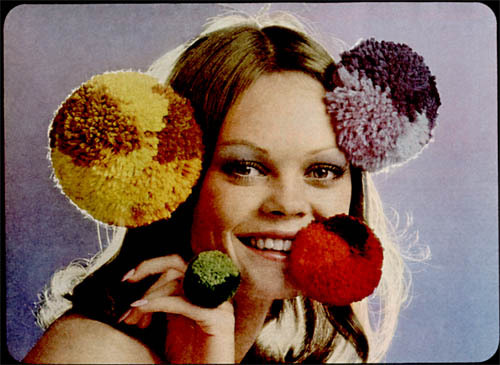 The photo of the woman with pompoms all over her face is not explained in the ad at all -- the only text consists of a catalog of booklet prices. Why would a woman have fluffy yarn balls attached to her head? Only her doctor knows for sure. I recently taught my daughter how to make these pompoms. It's a great activity for a 2d grader, and a great way to get rid of some hideous yarn I've had for way too long. How Much Is That Bunny In The Refrigerator? I'm as Busy as a Beaver! How Do Boys Learn To Hanky Panky? "A Poor Workman Blames His Tools"